Whether it is a dinner, meeting or special event, The Good Life Catering can accommodate your needs. We even have personal cooking classes. At The Good Life Catering we know how important your event is to you. We cater all types of events. Our company’s philosophy of full-service catering includes menu planning, rental coordination, setup and delivery, a full wait staff, and a colorful and elegant presentation unique to your event. 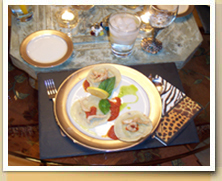 Private in Home Multi Course Dinners.